Instagram has announced a new private messaging feature called Instagram Direct, which will allow users to send a photo or video privately to up to fifteen followers. "Sometimes you want to be able to share not with everyone, but just a specific group," Instagram founder Kevin Systrom said at the company's announcement in New York. An update to the Facebook-owned Instagram mobile app released Thursday includes a new tab labeled, "direct," Users can tap that tab to send photos specifically to their friends and have conversations around those photos. There will also be a new option to "send to 1" on the app. The direct messaging feature will work in real time, enabling users to tell which of their friends have viewed the photo. They'll also be able to chat with friends in real time. "It's like you're gathering people around a photo or moment and being able to have a conversation around them," Systrom said. Unlike the copious rival messaging services, including Twitter (TWTR), WhatsApp, Google (GOOG) Hangouts, Facebook (FB) Messenger and scores of others, Instagram users can only direct-message text along with photos. Messaging private texts only isn't an option. Systrom noted that the feature is in its earliest stages. Right now, users can choose which friends they want send directly to. In the future, there could be the opportunity to create groups or send multiple pictures directly. Systrom dismissed rumors that Instagram would launch a Snapchat-like, feature, enabling users to let their direct images and messages disappear after a set time. Related story: What is Snapchat? "What we're best at is archiving and sharing with their friends," he said. 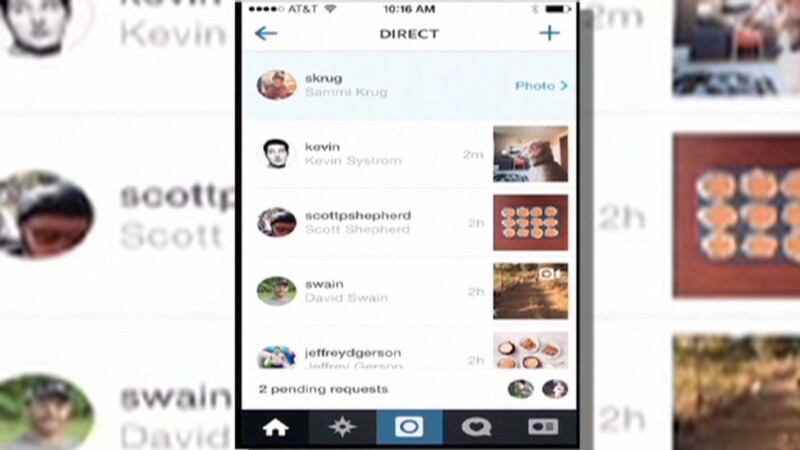 Systrom also addressed Instagram's ongoing effort to advertise. Instragram launched ads on its service for the first time this year, but -- at least for now -- Instagram Direct will remain ad-free. "It's way too early to advertise on Instagram Direct," he insisted.